After the last ODI played with West Indies at Dharamsala has helped Indian batsman Virat kohli to move up to the second spot in the ICC ODI rankings by scoring brilliant 127 runs in the final match and contributed to India 2-1 series win, while on the other hand medium pacer Bhuvneshwar kumar has make into the top-10 bowlers list for the first time in his career. Now he has achieved his career best ranking to be at second spot in the latest ICC ODI rankings for batsman. The former Captain of Indian victorious team at the 2008 under 19 Cricket World Cup held in Malaysia has made his ODI debut in 2008 was also the part of the Indian team which won the 2011 world cup. 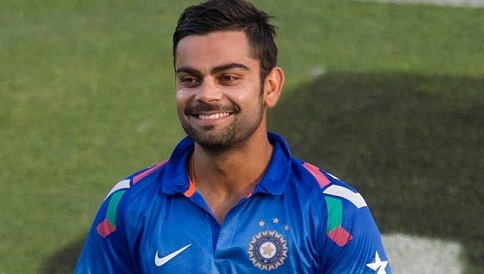 In One Day International (ODI) cricket, Kohli holds the record for the fastest century by an Indian batsman, and became the fastest to 17 hundreds in ODI by any batsman. He is the fourth batsman in ODIs after Saurav Ganguly (1997-2000), Sachin Tendulkar (1996-98) and Mahendra Singh Dhoni (2007–09) to hit 1000 or more ODI runs in three or more consecutive calendar years. Indian skipper MS Dhoni was the next best India at number six (unchanged) while Shikhar Dhawan lost a place to be eighth. Left-handed Suresh Raina gained three places to move to 15th. In the team rankings, India remain at number two with 113 points share this spot with South Africa, who have a chance to gather the first spot if they beat New Zealand in the three match ODI series, starting Wednesday. Bhuvneshwar took only two wickets in the series but he jumped seven places to number seven, just behind Ravindra Jadeja, who slipped to sixth from fifth. Paceman Mohammed Shami, who ended the series as the most successful bowler with 10 wickets, jump five places to 16th and has broken into the top 20 for the first time in his career.